How are you my dear blog viewers! Do you feel hot for today? Is summer there still going more hotter? Here in the Philippines, call center is in demand and more hot… Many of it are on its operation and still giving more job opportunities for those graduates who wanted to apply and are interested. As with the picture depicted, call center applicants are on their one on one interview with the personnel. As I am doing my job, I could not concentrate coz at the back of mine, they are doing a job interview and they talked loudly. If you are on my situation how could you handle this one? I was irritated by their voice. The two- day job interview was not good for me. I hope they can find another venue for the final screening. Goodluck to call center applicants! Good evening my dear blog viewers! I hope all of you are doing fine. Is it hot over there? If you see the road, it is almost wet, why? The rain still keeps on falling down and what do you see in the corner of the road? Is there a pedicab in your town? 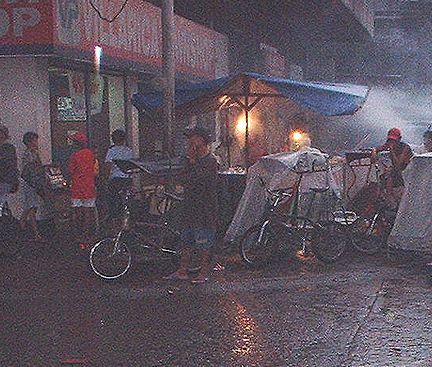 They are waiting for the passenger but cannot catch because some may take a ride in taxi or jeepney to protect themselves from the rain. Their situation is more difficult than the taxi driver and jeepney driver, why I think like that? When they have passenger of course, they bring the passenger to his/her destination but almost wet from the rain. It is a conflict between nature and himself. He might get sick and the money or income he gets from his driving is not compensated from his medication if it happens. What do you think about this? Am I right? Good evening to you my fellow blog viewers! How do you do? Did you enjoy your weekend? Are you used to go in the parlor for pedicure and manicure? Well, here in the Philippines not anymore in demand by going to a parlor. Old customers or known customers only make a call for a house service then that is the chance and time that the manicurists will go to the customer’s house or in another way around the customer’s might call and set a time to be there in manicurists’ house and she just wait. The customer pay for P50 manicure and same price also of pedicure unlike price in the parlor which is higher. If you were a customer what is your choice? In the parlor or house service? Have a nice day!